We're starting to see the first hints of spring around here, and I cannot wait! Of course, living in Wisconsin means the weather will continue to tease us with warm, sunshine filled days in between cold snaps and snow until practically June. Still, my mind is on airing out the house and doing some spring cleaning – especially with the kids and dog tracking mud across the kitchen floor! I'm all about working smarter and finding ways to be more efficient with my time. As the weather gets nicer, I'd rather spend time outside with the kids, not cleaning the house! Life’s demanding enough. Dinner shouldn’t be. On-Cor does the prep work, so you can take care of other to-do’s that need to-doing. There's something refreshing about sprucing up the house as the weather gets warm enough to open the windows and doors. I start to feel ambitious about cleaning the house top to bottom, but then wonder how the heck I'm going to get it all done. Do you feel that way too? Things don't really slow down yet with kids' activities and I'm finding myself searching for at least an extra hour in the evening to get things done. Thankfully, I have some easy dinner options in my freezer like On-Cor. They recently enhanced their products to satisfy the needs of moms looking for convenient, quality dinner solutions for their families. So, while dinner is in the oven, I can use that time to get other things done like cleaning the house. There is no way to get the place clean and shiny, top to bottom, in less than an hour. It's just not going to happen. Instead, have realistic expectations for how many chores you can complete before getting dinner on the table. You don't have to do it all in one day. A little day by day, or even just a couple times a week, will help you chip away at your to-do list. Spring cleaning can feel overwhelming if you look at the entire house at once. It helps to write everything down. Start by thinking of all the things that need to get done in one room, then the next room. Don't just write down CLEAN THE KITCHEN either. You need to break it down by areas of the room and specific tasks. For example, in the kitchen you may write throw out old food from the fridge, wash shelves in refrigerator, clean the oven, declutter dishes, and sweep the floor. 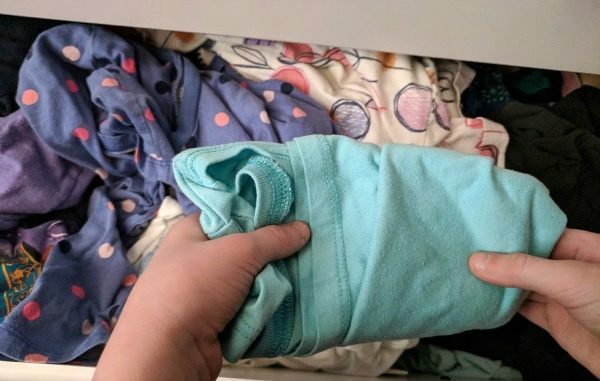 Another example is your kid's room: purge outgrown clothing, pack away winter items, clear off dresser, purge outgrown toys, throw away broken toys, declutter papers brought home from school, dust, and vacuum. Not only will you have a timer to know when dinner is done, but you'll want a timer in order to split up the time you have available. 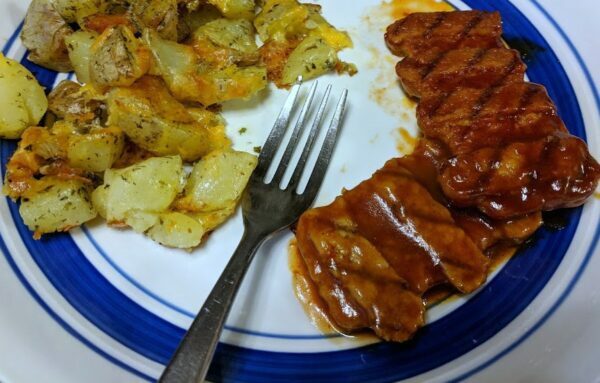 While the oven pre-heated, I quickly made a side dish of cheesy roasted potatoes to go in with the Barbecue Sauce & 6 Boneless Rib-Shaped Patties entrée. I love that you can keep your On-Cor entrée as is, or put a personalized spin on your favorite meal, such as turning the Gravy & Salisbury Steaks into sliders, or adding chicken to the flavorful Macaroni & Cheese. 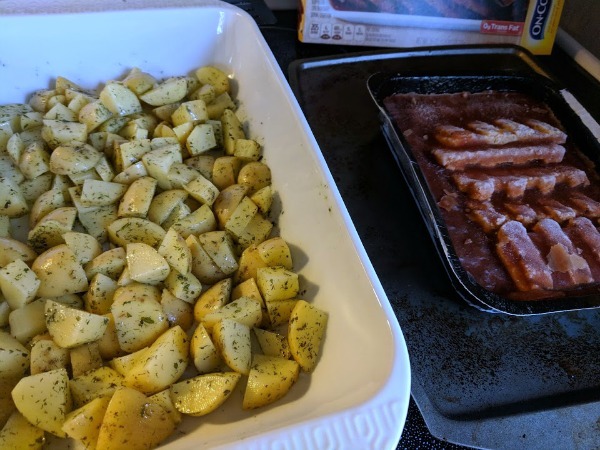 I knew once I put the entrée and the potatoes in the oven, I'd have about 45-50 minutes to work on chores. I don't know about you, but I am more productive when I have a limited amount of time to get things done. Set a 10 minute timer to get the first task done, then repeat. Depending on your task list, you could tackle five chores before dinner beeps! For this cleaning power hour, I'd suggest sticking to several chores that are not overly time consuming or ones you can easily stop working on and continue again later, such as sorting through papers. It felt great to cross several things off my to-do list by the time we sat down to eat! Want to get even more done? Then enlist your little helpers. If the whole family pitches in, you'll get so much done in under an hour! You can all work on the same room together or divide the list however you want. 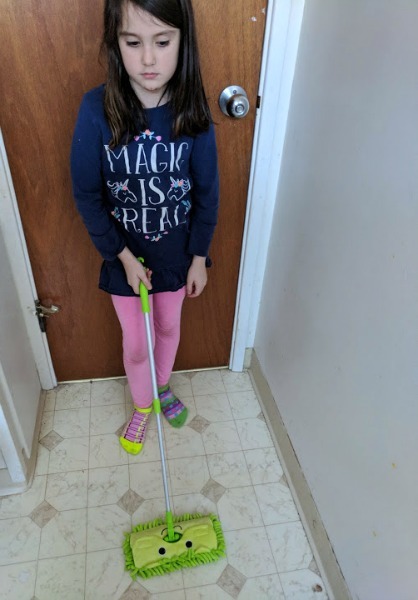 I like to give the kids easier tasks like wiping down surfaces, sweeping, dusting, and mopping. Get more ideas on chores for kids here. We were goofing around and she pretended her mop was a guitar! Wondering how to get reluctant kids involved? You can use a printable chore chart. Some kids love the recognition and seeing what they've accomplished. Another option is to buy a kids cleaning set. Let's face it, adult cleaning supplies tend to be boring. 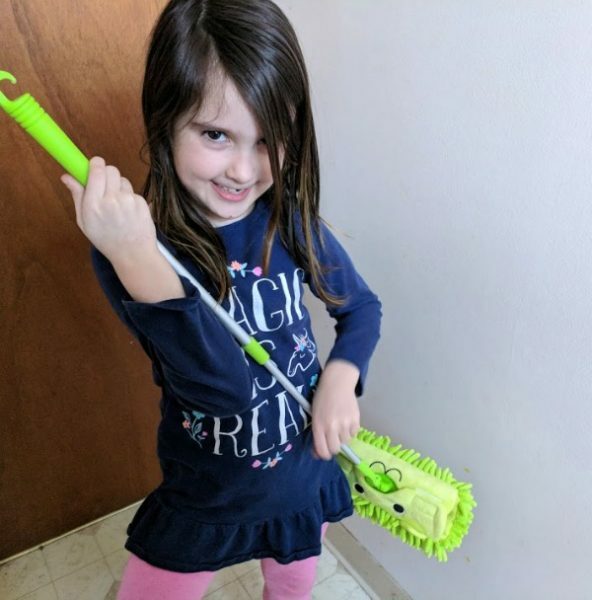 An adorable, colorful kid sized mop is way more fun (and easier for them to manage). You can also make it into a game. See who can get to their assigned area the fastest or how many chores can everyone get done. You could also turn chore assignments into a game by picking them out of a hat. Our favorite way to make doing chores together more fun? Blasting some upbeat music! I hope these tips help you with how to tackle spring cleaning at your house. With a little planning and utilizing simple dinner solutions, you can knock several things off your to-do list! 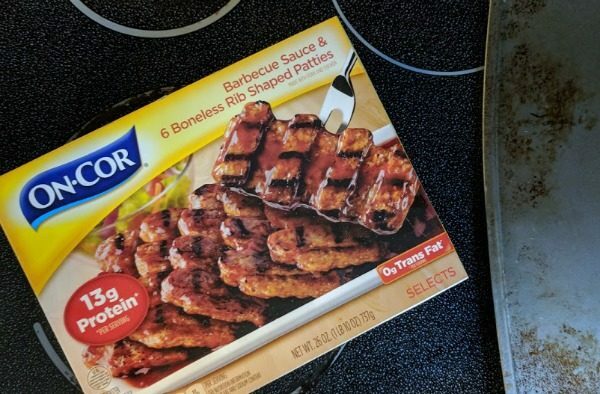 For your next family meal, head to the freezer aisle of Meijer or check out the store locator at www.on-cor.com to pick up one of On-Cor’s entrées. Thanks to our sponsor for providing a prize package for one of our readers! Winner must be 18+ years old and reside within the U.S. Winner will be contacted by email and must respond within 48 hours in order to claim their prize. To enter leave a comment below telling us what your favorite On-Cor entrée is and which area of your house you'll spring clean first! Giveaway ends Thursday, March 22, 2018 at 11:59PM CT. I like the barbecued pork riblets that you tried. We eat those a few times a month, but we eat them on buns like a home version of the McRib. That barbecue sauce they use is good enough to drink!! I like the chicken patties, they are a quick and easy meal. I’m going to start spring cleaning in my closet first and clean out old clothes and other unwanted items. The Penne Pasta & Meatballs with Tomato Sauce is my favorite. My first spring cleaning project is going to be my kids’ closets. I’m convinced they’ve outgrown 80 percent of their clothes over the winter! Congrats, Michelle! I’m sending you an email so you can receive your prize. My favorite On-Cor Entree is the salisbury steaks, The first place that I need to re-organize is the kitchen. I want to try the penne with meatballs though we like the lasagna with meat sauce too. I have already started with the closet in our spare room, it seems to collect everything. Our favorite is the chicken patties. First thing I will clean is the bedrooms. We like the Salsbury Steaks and Gravy. And I need to start spring cleaning in the kitchen. It’s never really recovered from all the holiday baking and needs a good scrubbing. We love the chicken parm! My family would clean the living room.